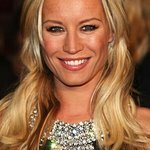 Denise van Outen has gone from yummy mummy to star athlete to launch the first ever Sainsbury’s Sport Relief Games. Denise showed her strength in her swimming gear as it was revealed that for the first time ever the public can take part in three sporting challenges for Sport Relief – running, swimming and cycling – all over one epic weekend from 21st – 23rd March 2014. The events will take place in over a thousand locations across the country including landmark events at Queen Elizabeth Olympic Park. Those lucky enough to get a place will be one of the first to experience the Park in all its glory as it fully reopens next year, with events and entertainment taking place over the fun-filled weekend. Anyone wanting to guarantee a space at the Park or other venues across the UK and make the most of half price entry can enter at www.sportrelief.com. As well as accessible events for everyone, the new Sainsbury’s Sport Relief Games offer the public even sportier challenges than ever before. Whether people want to cycle 50 miles, swim 5km or run 6 miles, those looking for a challenge need to sign up early, start training and make every mile count by raising heaps of cash for some of the poorest and most disadvantaged people in the UK and around the world. People can get on their bikes and take part in the Sainsbury’s Sport Relief Cycle, taking place in Glasgow, Manchester and London’s Lee Valley VeloPark. Participants can cycle 25 miles, 50 miles or get the whole family involved in a 3 mile cycle Money raised from Sport Relief will be spent helping some of the poorest and most disadvantaged people in the UK and around the world. For more information about how to have fun, raise cash and change lives by entering the unmissable Sainsbury’s Sport Relief Games, go to sportrelief.com.